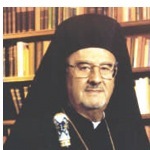 In this historic interview on Ancient Faith Radio, Metropolitan Philip talks candidly about such things as Orthodox unity, music, our witness to the world, his most memorable accomplishments as well as his biggest disappointments. This two part interview was conducted by Fr. Peter Gillquist, Chairman of the Department of Missions and Evangelism in the Antiochian Archdiocese. It was Fr. Peter and a large contingent of Evangelicals who were received into the Orthodox Church by Metropolitan Philip over 20 years ago. In addition to the HTML transcripts of the individual episodes below, Ancient Faith Radio is pleased to offer a nicely-formatted PDF transcript of the interview (2.4mb) for download.